Project RE:FOCUS, as constructed in Madrid, Spain for the 2010 Solar Decathlon Europe │ Photo by David To. The prototype currently under construction is sited in north-central Florida. It responds to the vernacular forms of homes in the area known as “Florida Cracker.” To address the climate of the region, Cracker homes were porous by design, constructing both large and small fissures to allow for natural ventilation to occur. One specific variant of the Cracker house was the dog-trot, where the living and sleeping areas were shaped as separate modules, each placed under a larger continuous roof. The space between the modules allowed for sheltered outdoor living spaces and invited breezes to cool the homes. The construction system is designed to allow for mass-customization, where industrialized processes can be tailored to the region a home is to be constructed. The goal is to create armatures through which many architectures may grow. For more information on the competition, go to www.sdeurope.org. Site/Floor Plan. Image by Bradley Walters. Project Refocus Breezeway. Photo by Bradley Walters. Project Refocus with Screens Closed. Photo by Bradley Walters. Project Refocus Exterior Detail. Photo by Bradley Walters. Rigid Steel Frame System. Image by Bradley Walters. Structural Insulated Panel Assemblies. Image by Bradley Walters. Project Refocus Detail at Breezeway. Photo by Bradley Walters. Project Refocus Interior Detail. Photo by David To. Project Refocus Interior Detail. Photo by Bradley Walters. Design Study. Image by David To + Clay Anderson. South Elevation and Breezeway, Project Refocus. Image: David To + Clay Anderson. North Elevation, Project Refocus. Image: David To + Clay Anderson. South Elevation, Project Refocus. Image: David To + Clay Anderson. Images by David To + Clay Anderson. McGlothlin, Mark and Bradley Walters. “Unmoored Architecture: On Modules, Mobility and Manufacturing in the RE: FOCUS House.” Proceedings of the 2012 ACSA Fall Conference. Philadelphia PA: Temple University, 2012. (in press). McGlothin, M., Ries, R., Sullivan, J., Torres, M., Walters, B. & Walters, R. “RE:FOCUS. University of Florida. United States of America,” in Vega Sánchez, S. (Ed.) Solar Decathlon Europe 2010: Towards Energy Efficient Buildings. Madrid, Spain: 10Action Project/Intelligent Energy Europe Program, September 2011, 116-125. Palomino, Alex, Chris Sorce, Kevin Priest, and Bradley Walters. “Solar Decathlon Europe: A Look Back,” Presentation at the American Solar Energy Society National Solar Conference SOLAR 2011, Raleigh NC, 20 May 2011. Walters, Bradley. 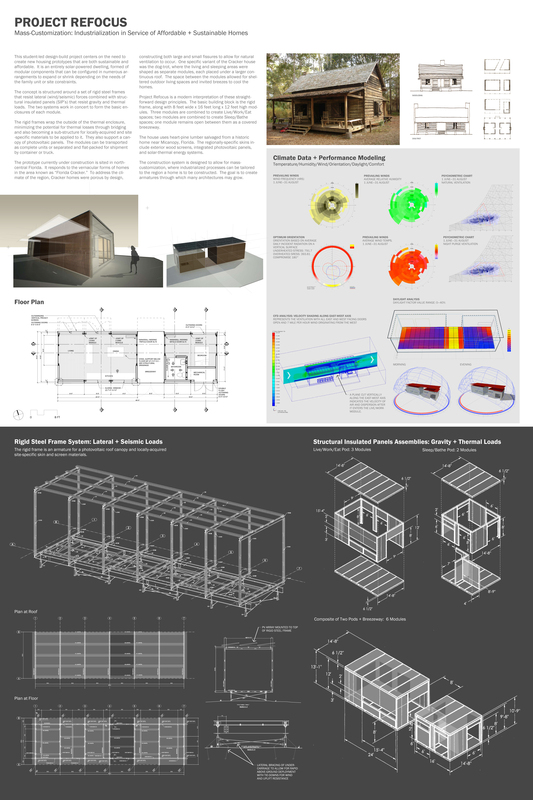 “Project RE:FOCUS.” Re.Building: Poster Proceedings. Edited by Bruce Goodwin and Judith Kinnard. Washington DC: ACSA Press, 2010, 38. Palomino, Alex. “Solar Decathlon Europe: My Look Back,” Solar Today. September/October 2010, 16-17. http://www.solartoday-digital.org/solartoday/20100809#pg16 (accessed: 9 March 2011). 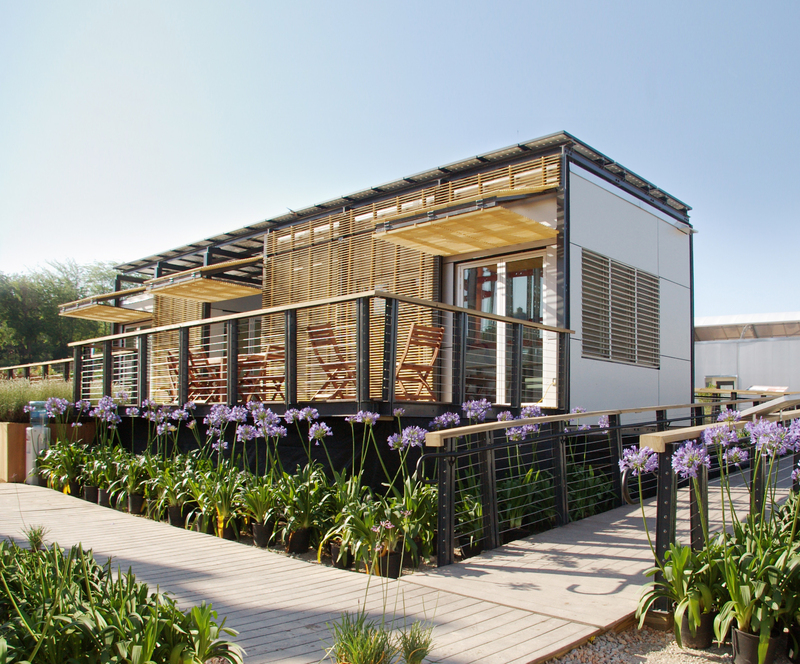 “Solar Decathlon 2010: Competing For The Greenest House,” Huffington Post. 24 June 2010. http://www.huffingtonpost.com/2010/06/24/solar-decathlon-2010-comp_n_623116.html#s104813 (accessed: 9 March 2011). “University of Florida Wins Communications and Social Awareness Contest at Solar Decathlon Europe,” U.S. Department of Energy Solar Decathlon. 22 June 2010. http://www.solardecathlon.gov/blog/archives/333 (accessed: 9 March 2011). Meinhold, Bridgette. “Sun-Powered RE:FOCUS House Set to Shine at Europe’s Solar Decathlon,” Inhabitat. 18 June 2010. http://inhabitat.com/university-of-floridas-solar-decathlon-entry-draws-from-traditional-vernacular/ (accessed: 9 March 2011). Watson, Kathryn. “Trucker Hats, Eternal Glory — oh, and some Sunshine,” The Florida Times-Union. 8 June 2010. http://jacksonville.com/opinion/blog/422145/kathryn-watson/2010-06-08/trucker-hats-eternal-glory-oh-and-some-sunshine (accessed: 9 March 2011). Koch, Wendy. “University of Florida Builds Solar Home for Global Contest,” USA TODAY. 5 June 2010. http://content.usatoday.com/communities/greenhouse/post/2010/06/university-of-florida-builds-energy-producing-house/1 (accessed: 9 March 2011). Cilento, Karen. Project RE:FOCUS / University of Florida,” ArchDaily. 2 June 2010. http://www.archdaily.com/62779/project-refocus-university-of-florida/ (accessed: 9 March 2011). Phillips, Victoria. “UF Students’ Solar-Powered Home Will Compete in European Contest,” The Gainesville Sun. 8 March 2010. http://www.gainesville.com/article/20100308/ARTICLES/3081006/1118?p=1&tc=pg# (accessed: 12 March 2010). Rutland, Meredith. “UF Team Builds Solar House for International Competition.” Independent Florida Alligator. 2 March 2010. http://www.alligator.org/news/campus/article_29d2cb22-25ab-11df-af8d-001cc4c03286.html (accessed: 9 March 2011). Hipps, Danielle. “UF Solar Home will Soak Up Rays in Europe,” The Gainesville Sun. 6 April 2009. http://www.gainesville.com/article/20090406/articles/904061009?Title=UF-solar-home-will-soak-up-rays-in-Europe (accessed: 3 July 2009). Venice Biennale 12th International Architecture Exhibition, Spanish Pavilion, “Architecture within Limits,” Solar Decathlon Europe 2010 Project RE:FOCUS, Venice, Italy, 8/29/2010 – 11/21/2010. Principal Team Leaders: Dereck L. Winning (Primary Contact), Rachel Compton (Health & Safety Officer), Jeff Humpal (Construction Manager), Paige Mainor (Public Relations Contact), Alex Palomino (Instrumentation Contact), Jason Parker (Cost Estimator), Kevin Priest (Project Engineer), Chris Sorce (Project Manager), David To (Project Architect), Jordan Wise (Fire Watch Captain). Additional Team Members: Christopher Anderson, Clay Anderson, John Atkinson, Brooks Ballard, Jacob Beebe, Luke Booth, Christopher Chappell, Isaac Church, David Cowan III, Laura Ettedgui, Dale Freel, Amy Guidos, Andrew Herbert, Jeanette Holloway, Lantz Holtzhower, Katherine Huber, Aaron Hynds, Jake Landreneau, Chris Loft, Amy Long, Oscar Koeneke, Robert Lyons, Matt McKinnon, Laura Meeks, Robert Menasco, Geoffrey Miller, Ryan Moose, Sean Morgan, Michael Osterling, Ryan Padgett, Jacklyne Ramos, Alex Ruhnau, Max Scott, Wyatt Self, Jessica Tomaselli, Crystal Torres, Ian Trunk, Peter Vastyan, Marie Vogler, David Wasserman, Erin White, Randall Wilhoit, Amanda Young, Erika Zayas. The project is structured fundamentally as a student-led effort, with support and direction provided by a core team of faculty advisors and project investigators. My role within this team has been principally advisory in nature. While I was teaching abroad in early spring 2009, Associate Professor of Architecture Mark McGlothlin directed a vertically-integrated design studio that developed a number of concepts and produced the initial deliverables. I joined him and the team in March 2009, and was most involved in the project’s development during the late spring, summer, and fall 2009. The summer months were particularly important. I assisted the students in developing construction details and logistical strategies during this time, while also helping to formalize and clarify the project’s motivators. I also assisted Professor McGlothlin in developing division one of the specifications for the construction deliverables as required by the competition organizers. The sketches included here and on the pages that follow are some of the many I produced during the course of the project’s development, using real-time drawing during meetings as an operative tool, allowing for ideas to be translated immediately into material and/or construction strategies, and helping to rapidly build consensus. As a part of the collaborative process, these collectively served as significant contributions to the design process. As the project moved to Madrid, I assisted in organizing and directing students during the on-site build phase, the competition, and the deconstruction phase. During deconstruction, I worked closely with Prfessor McGlothlin to develop an efficient logistics plan to allow the work to be completed within the four days that we had on-site. We are now preparing to rebuild the house on the campus of the University of Florida in Gainesville, Florida over the course of the next year. I anticipate working closely with my fellow faculty to direct this effort through construction and occupancy.